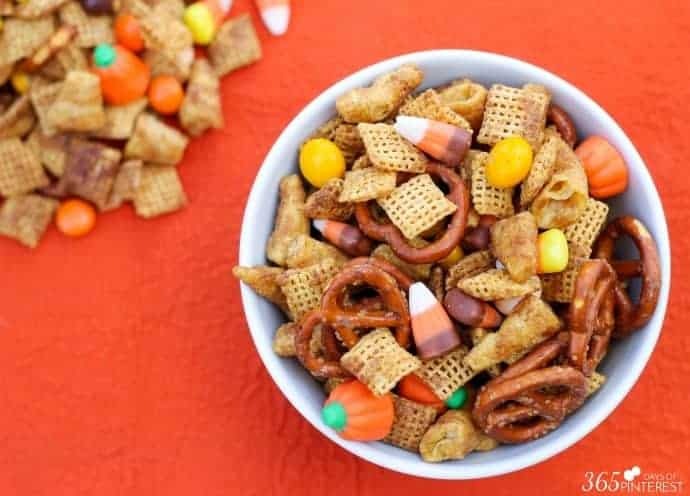 The combination of salty and sweet Chex Mix treat, with just a touch of spicy cinnamon, makes this Pumpkin Spice Snack Mix perfect for fall! 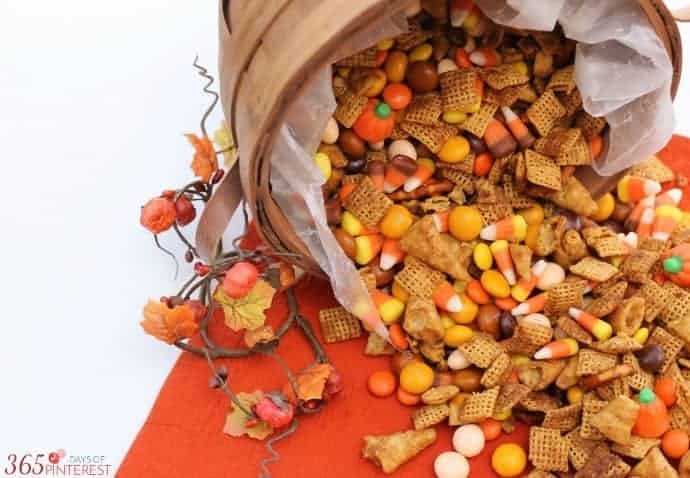 Pretzels, Bugles, Candy Corn, Butterscotch M&M’s and more! 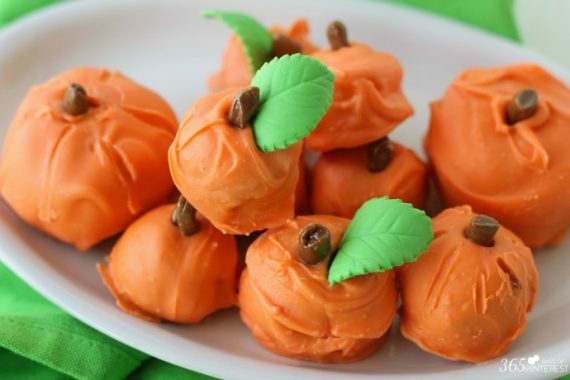 Pumpkin desserts get you all ready for the Fall! Some our favorite pumpkin desserts are our Pumpkin Spice Bites and our delicious Chocolate Chip Pumpkin Bread. Hello again, Pinky Pals! It’s Nicole from 365(ish) Days of Pinterest and I’m back this month to celebrate the coming of fall! YAY! It’s my favorite season because of the cooling weather, crisp air, apples, pumpkins, warm cinnamon, boots, jeans, rich colors and the anticipation of the coming holidays. I recently went on a road trip to Arizona for a blogging conference and I wanted to make a snack mix to bring along with us. I had looked at the store for some packaged mixes, but nothing had exactly what I wanted. So I figured I’d just make my own. 🙂 Now, don’t let the presence of candy corn turn you away. 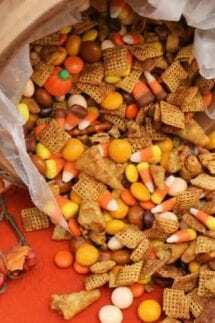 I’m not a huge fan of candy corn, but with this combination of flavors, it just works. Trust me. Side note – if you love pumpkin, be sure to try this my friend Cindy’s Pumpkin Roll Recipe! It is delicious! Grab a big bowl and fill it up for Halloween parties, Harvest Festivals, Thanksgiving or any other excuse you’ve got to party this fall. It’s easy to double the batch- just bake on two cookie sheets. 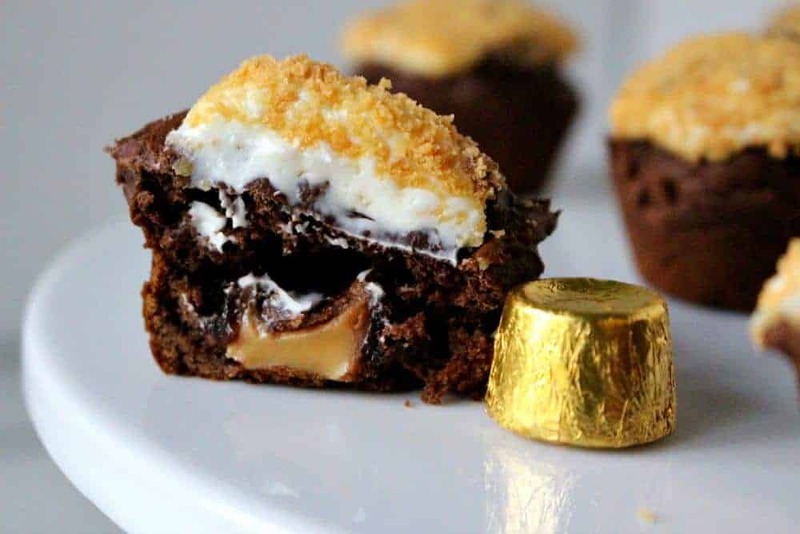 The M&M’s aren’t a requirement and they can get a little pricey, but they do add a delicious layer of butterscotch flavor. But feel free to switch them out for something else if you’re trying to keep the price down for a larger batch or if you cannot find the Butterscotch version (just use plain). Happy Fall! 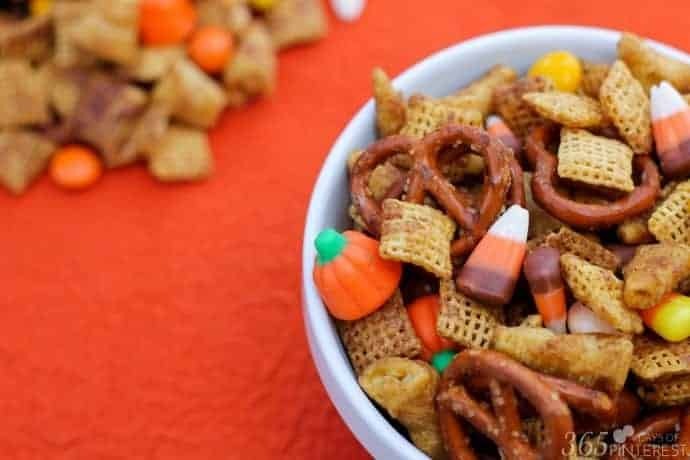 The combination of salty and sweet with just a touch of spicy cinnamon makes this Pumpkin Spice Snack Mix perfect for fall! In a small bowl, stir together melted butter, brown sugar, pumpkin pie spice, and vanilla and then pour over the dry mix. Stir to coat. Spread on wax paper to cool and then toss with the candy pieces. 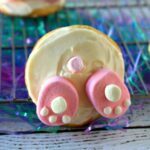 Nicole makes other yummy stuff that’s perfect for parties-be sure to check them out, too! Apparently, Caramel Bugles are not available in the Austin area. Any suggestions for a replacement? Should I add plain Bugles? You could try kettlecorn or I would use the plain bugles. Can you microwave the cereal mix; as you can with regular chex mix? How early in advance an I make for a party? How long can you keep in an air tight container? These are amazing and so delicious recipes. I can not control To eat It. Thanks for share. Looking so yummy. It is really so delicious. I really loving It. How amazing this is, i really love this kind of food. It is really amazing post and This is at Thanksgiving and going to make it again for Christmas with red and green M&M’s. 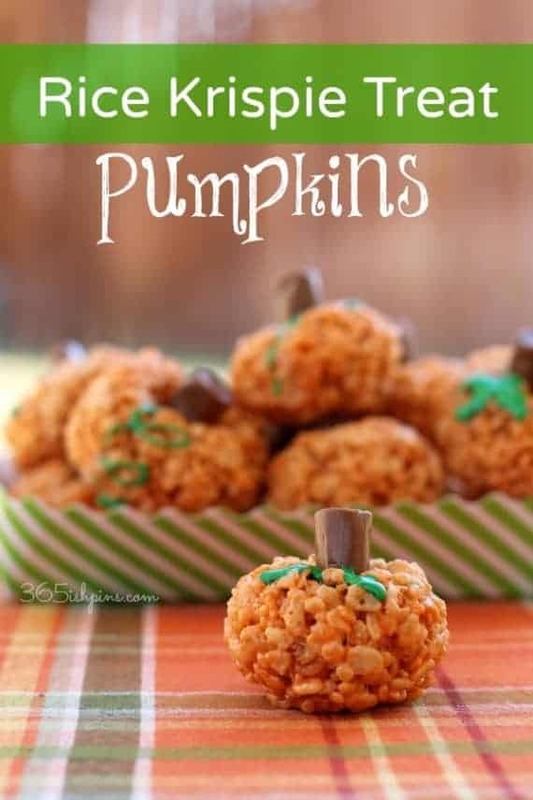 Such a great recipe for Fall! I have not seen the Caramel Bugles, I must look for those! Yum! 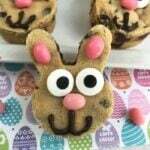 What a fun, festive and easy snack! This has everything in it that we love. I can’t wait to whip it up and give some away! This stuff is addicting! The kids love it! This is my kinda snack! 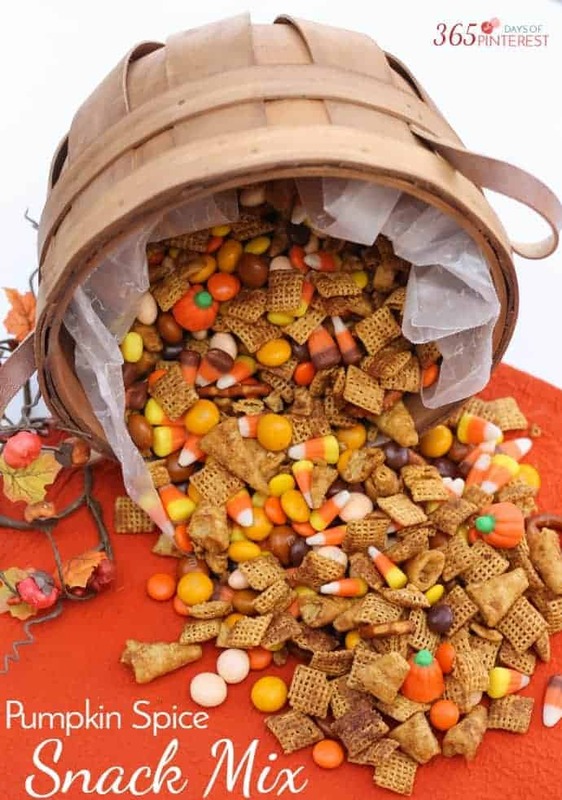 We’ll be taking this with us to the pumpkin patch, it’s the perfect Fall munch! I love anything pumpkin spice, so this is calling my name. I bet it is extra tasty with the Honey Nut Chex! really amazing recipe can’t wait to try at home keep sharing!